Large, dense, slow-growing shrub or small tree. Dull dark green leaves with a thin buff indumentum underneath. 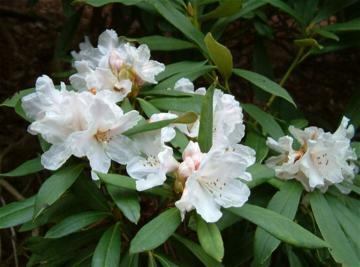 Compact trusses of white flowers sometimes slightly pink blushed, with a few crimson spots inside, opening from pink buds. Very early flowering from January to March, or even earlier in a sheltered position. Raised by Cunningham & Fraser of Edinburgh. Hybrid of R. arboreum 'Album' x R. caucasicum.